Derby fans, we have the photos for you. 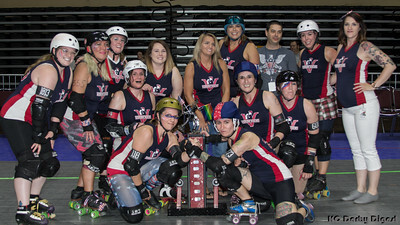 The 2015 Rink of Fire Championship was everything we’d hoped for, but not everything we predicted — while the Knockouts indeed brought home the win in the third place grudge match, the Victory Vixens were the ones who emerged victorious to become the 2015 Rink of Fire champions. You can find all the photos from this fantastic event at that link. Yeah, it’s been a minute, but we got ’em done and got ’em published. Feel free to share them on social media if you like, and if you do, please include the caption “photo by KC Derby Digest.” It helps people find us! Congratulations to the Knockouts and the Victory Vixens on their Rink of Fire wins this year, and many, many thanks to the Kansas City Roller Warriors organization not only for doing what they do each and every season, but for allowing us to participate and cover one of the finest leagues we’ve ever had the privilege of watching trackside. We can’t wait to see these ladies back on the track in 2016.